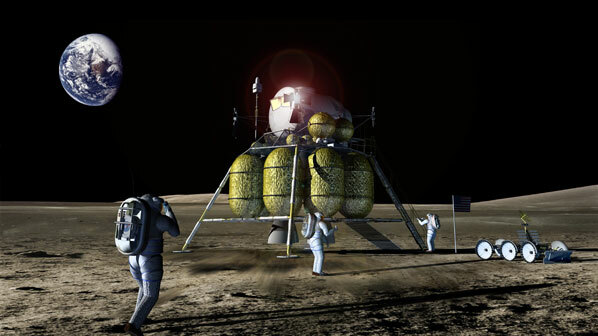 Two-in-one lunar lander: This artist’s concept of the new lunar lander shows three of the four crew members and a lunar rover. Unlike the Apollo spacecraft, the new system won’t require anyone to remain in orbit while the lunar excursions are going on. Image credit: NASA/John Frassanito and Associates. When President Bush unveiled the Vision for Space Exploration in January 2004, he offered only the most basic future milestones: completing the International Space Station by 2010; introducing a new spacecraft, the Crew Exploration Vehicle (CEV), by 2014; and returning humans to the Moon by 2020. NASA was left with the task of developing the plan that would achieve those goals. back to the Moon, those efforts were ratcheted up a notch with the arrival of new NASA Administrator Michael Griffin in April. Dissatisfied with the progress to date, Griffin had the agency’s exploration office carry out a 60-day study to develop a more detailed plan for the return to the Moon, with an emphasis on the key components-including spacecraft and launch vehicles-needed for the plan to succeed. The Exploration Systems Architecture Study (ESAS), released by NASA on September 19, offers the most detailed explanation to date of how to turn the Vision for Space Exploration into reality. When America first sent astronauts to the Moon in the 1960s, it had to start from scratch, developing brand-new spacecraft and launch vehicles that pushed the cutting edge of aerospace technology of the day. The ESAS plan reflects a different approach: Rather than starting from scratch, NASA is using a combination of designs and hardware from the Shuttle program, some of which date all the way back to Apollo. At the heart of the architecture is the CEV [later named Orion]. The CEV strongly resembles the Apollo spacecraft, with a conical crew module attached to a cylindrical service module. It is not simply an Apollo replica, however; with a diameter of 5.5 meters, the CEV will be able to accommodate up to six astronauts on missions to Earth orbit, to the Moon and even to Mars. The CEV will be powered by solar panels, rather than the fuel cells used on Apollo, and is designed to be reusable: NASA hopes to fly each CEV up to 10 times, replacing just the heat shield after each flight. 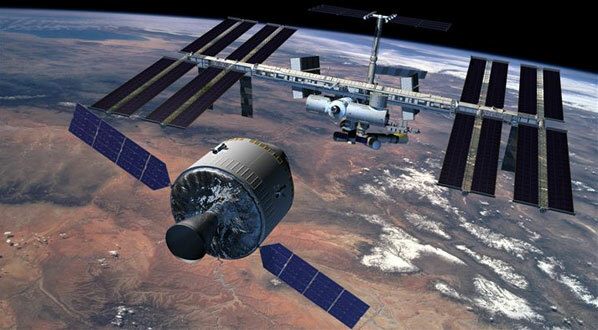 Crew Exploration Vehicle: Before any journeys to the Moon, the new spacecraft would be used to ferry crew members and cargo to the International Space Station, as shown in this artist’s concept. Image Credit: NASA/John Frassanito and Associates. NASA plans a phased development of the CEV. After a few years of unmanned suborbital and orbital test flights, the Block 1A CEV will begin human missions to the International Space Station in 2011, carrying three to six passengers. (A Block 1B version, which replaces the crew with 3,500 kilograms of cargo, will also service the ISS.) Later in the decade, NASA will introduce a Block 2 version of the CEV with an enlarged service module, designed to carry four astronauts to the Moon. A Block 3 version capable of supporting six people on a mission to Mars is already on the drawing board. To launch the CEV, NASA will develop a new launch vehicle. “New” may be too strong a word, though, since the “crew launch vehicle” (NASA has yet to announce an official name for the rocket [later named Ares I]) will be comprised largely of existing components. The lower stage will be a four-segment solid rocket booster of the type used to launch the Space Shuttle, while a new upper stage will use a Space Shuttle Main Engine (SSME), fueled by liquid hydrogen and liquid oxygen. The rocket, which stands nearly 90 meters high, will be able to put about 25 metric tons into low Earth orbit (LEO), about the same capacity as the Delta 4 Heavy. The same approach is being taken for the development of a new heavy-lift launch vehicle required for missions to the Moon. This rocket (also not yet officially named [later named Ares V]) will feature a first stage derived from the Shuttle’s external tank, with five SSMEs mounted on the bottom. Attached to either side of the first stage will be two five-segment solid rocket boosters, extended versions of the ones used to launch the shuttle. The result is a rocket that is 109 meters tall — just a few meters shorter than the Saturn 5 — and is capable of placing 125 metric tons into LEO. 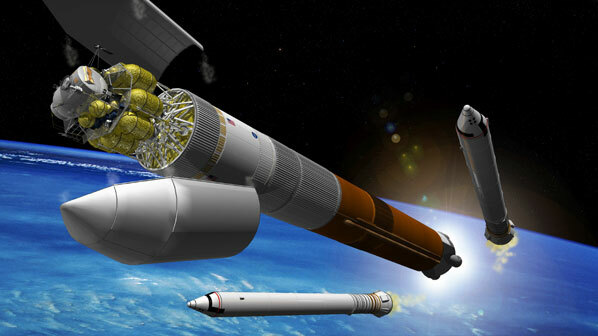 Space Trucking: A heavy-lift vehicle, for carrying cargo such as the new lunar lander, would be launched by larger versions of the space shuttle’s solid rocket boosters and five space shuttle main engines. Here, it’s carrying a lunar lander and a “departure state” which will dock with the crew capsule before heading to the Moon. Image Credit: NASA/John Frassanito and Associates. This heavy-lift vehicle will be used to launch two key components. One will be the Lunar Surface Access Module (LSAM), a lunar module designed to carry four people between lunar orbit and the surface. The other will be the Earth Departure Stage (EDS), an upper stage powered by two J-2S engines — modified versions of the J-2 engines used on the second and third stages of the Saturn 5 — that will propel the CEV and LSAM to the Moon. As currently envisioned, each lunar mission will feature two launches: one using the heavy-lift vehicle carrying the EDS and LSAM, followed by a crew launch vehicle carrying the manned CEV. Once in orbit, the CEV will dock with the LSAM and EDS. The EDS will then fire its engines to put the spacecraft on a lunar trajectory before being jettisoned. At the Moon the LSAM (rather than the CEV, as was the case with Apollo) will fire its engines to put the spacecraft in orbit. The crew will transfer to the LSAM and descend to the lunar surface, leaving the CEV unmanned in lunar orbit. Once their mission is done, the crew will return to the CEV using the ascent stage of the LSAM, just as with Apollo; the LSAM will then be jettisoned and the crew will return to the Earth in the CEV, parachuting to an airbag-cushioned landing at Edwards Air Force Base in California or elsewhere in the western United States. 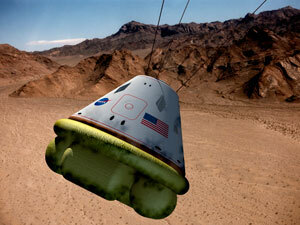 Return to Earth: the capsule’s landing could be cushioned by airbags. After the heat shield is replaced, the capsule could be re-used up to ten times. Image Credit: NASA/John Frassanito and Associates. The first lunar missions, scheduled for 2018, will be relatively short: no more than a week. Over time, however, NASA plans to extend the missions as it builds up experience and infrastructure on the lunar surface. By 2022, though, crews will spend up to six months on the surface at a time as NASA develops a permanent lunar outpost, most likely in the south polar regions of the Moon where deposits of water ice may exist. That impression, coupled with the program’s price tag-which Griffin estimates to be $104 billion over 13 years- could cause problems in Congress. Just days after NASA unveiled the exploration plan, the Republican Study Group, a caucus of fiscal conservatives in Congress, unveiled “Operation Offset,” a proposed list of spending cuts designed to pay for the costs of hurricane relief. One of its biggest suggestions: canceling the entire exploration program, saving an estimated $44 billion over 10 years. One way to alleviate those concerns, and to differentiate this new plan from Apollo, is to involve other nations in the effort. Since the president’s original announcement about the Vision for Space Exploration, NASA has cited international cooperation as one of the program’s key aspects. NASA officials see a potential role for other nations building components of the system, from the EDS to components of the CEV or LSAM, depending on their level of interest. “We need to understand where their interests are and where they fit,” said Cooke. Another key difference between the new exploration program and Apollo is its ultimate goal. For Apollo, the goal was straightforward: Beat the Soviet Union to the Moon. Apollo succeeded, but failed to create any significant lasting infrastructure that would allow humans to live and work on the Moon. The Vision for Space Exploration is different. The program — as carried out by ESAS — is not driven merely by competition to reach the Moon; instead, it aims to create an infrastructure that can be used not just to send humans back to the Moon, but to establish a permanent presence there. It also lays the groundwork for human missions to Mars, which Cooke said could be carried out as early as 2030 under the plan. the LSAM that will use liquid oxygen and methane, a propellant combination not previously used on American manned spacecraft. Why methane? NASA is looking ahead to missions to Mars, where methane can be produced in situ, rather than be hauled all the way from Earth.